I'm a writer, but I don't just write books. I have also written a few role-playing games, many of them connected to the Cthulhu Mythos, for example my game called Present Day Cthulhu, which is available from DriveThruRPG. The Cthulhu Mythos isn't as obscure as it once was, and most nerds in the know are at least aware of it these days. Most are also aware of the controversy attached to the inventor of Cthulhu and of its themes of cosmic horror. The element of the Cthulhu setting that I was thinking about when I wrote this post wasn't cosmic, it was actually something a little tangential. I was thinking about the way magic is depicted in the stories of the Cthulhu Mythos. The Cthulhu Mythos does have magic spells, just like many other fantasy settings, but these aren't the fireball type spell found in Dungeons and Dragons. Magic is different in the Cthulhu Mythos as Stack Exchange explains. One consequence of magic in the Cthulhu Mythos, for example, is that magic eventually destroys the caster's mind. Theoretically this should make magic something shunned and unhealthy, rather than something characters will seek out. 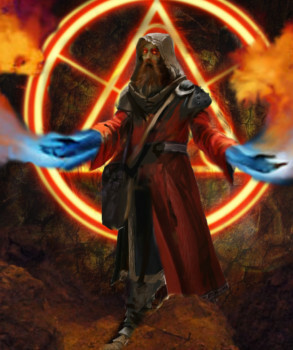 In a more typical magic system spells are sought after rewards, a character will learn a selection and power them using magic points. In the Cthulhu setting, however, casting spells is extremely rare, and not always a survivable experience. Characters don't build up a repertoire of spells that they throw around casually, like in most other fantasy games. In theory, I like this conception of Cthulhu magic, but it also seems like keeping magic away from players in this way is also keeping a lot of the fun away from players. At Yog-Sothoth there are Cthulhu game masters who want a more usable magic system. One of the posters on the site does warn, however, that summoning spells can completely transform a game. If characters can call up a hunting horror whenever hey like, they can deal with an awful lot of obstacles easily. The trick, therefore, is allowing characters a taste of magic they can use, without giving them the tools to blast their way through whatever obstacles the game puts in their way. The way to do this, I think, is to make sure the spells that are available, interesting and useful, but not just weapons. The site Into the Mound talks about Cthulhu magic as being concerned with cosmic things. Spells are used for opening gates between dimensions and commerce with monsters. They provide entry points into adventure rather than weapons to be used in an adventure. Another interesting type of spell that is hard to weaponize is necromancy. For example there is a necromantic practice by which spirits are trapped in bottles. Each bottle contains a pendulum which the spirit can swing to tap the side of the bottle, allowing some sort of communication. It's creepy, and a useful source of clues, but hardly something that will unbalance game play. In most fantasy games magic is learned speedily, and here Cthulhu magic is similar. Dan Harms talks about how quickly Mythos magic can be learned. He says that there are quite a number of spells that are easy to learn in a short period of time. For example, Doctor Willett learns the resurrection formula by paging through Curwen's papers. Henry Armitage seems to learn the spells necessary to dismiss the Dunwich Horror in short order. His evil counterpart, Wilbur Whateley, learns a spell in less than a day from a diary entry. But some effects take longer, such as the frustration of needing to learn "all the angles of the planes and all the formulas between the Yr and the Nhhngr" over a period of years in order to master the techniques of dematerialization. These magic spells are a fascination little corner of a huge and cosmic world of horror. They aren't the focus of the stories, but the stories wouldn't be the same without them. My game, Present Day Chthulhu, is available from DriveThruRPG. But I write horror novels, too. My zombie novel is named for the most fearsome ability of the undead creatures in the book: Death Sense. These are old-school walking zombies, and they are not easy to kill. It is available from Amazon.